I cannot say enough amazing things about Lynne! Not only is she an unbelievable make-up artist, but she is truly such a kind, calming presence who was a joy to have around on my wedding day. She is such a pro with both traditional foundation and airbrush, and my make-up did not move throughout the day despite the 95 degree weather! She also includes lashes in her pricing, which really made each girl pop. She made everyone look naturally beautiful, enhancing their wonderful features, and I LOVED how she didn’t overdo it or make anyone look fake/unlike themselves. My mom was especially hesitant to have her make-up done professionally at risk of “not looking like herself” and Lynne was FABULOUS. She calmly put her at ease and made her feel beautiful. I would absolutely recommend Lynne to anyone, and look forward to having her do my make-up again! If I could give her more than 5 stars I would!! Lynne is a genius. Being in the entertainment field for many years, I am very particular when it comes to my makeup and I don't trust many people. Lynne had my trust as soon as we connected at my makeup trial. She is compassionate, she listens and she obviously loves what she does. How she made me look after only sleeping 4 hours on a red eye.... I knew I was in wonderful hands. She is literally brilliant. My makeup was flawless on the day and my entire wedding party looked stunning. Lynne is a truly gifted makeup artist and I couldn't recommend her enough! Lynne did such a wonderful job for for my wedding this past August! I have been going to see Lynne for over a year now. 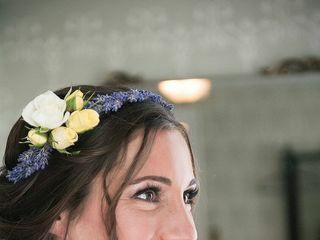 I was able to get my bridal shower makeup done by Lynne, and I also went to her for facials during the months leading up to the wedding to ensure my skin looked great for the big day! Lynne has such a great energy - exactly the type you want around you on your big day!! My bridesmaids, mom, and MIL could not say enough good things about her work. My MIL is actually specifically going to Lynne for her makeup for her next son's wedding because she did such an amazing job!! 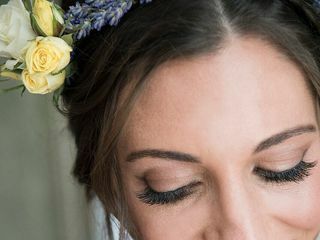 Do yourself a favor and look no further for your wedding makeup artist. Hire her, and you'll be SO glad you did. Lynne was amazing. She did my make up for my wedding, along with two other women. She was efficient, kind, and accommodating. She was also very fun to be with, and was very calm, which is great for the big day! She's an ultimate professional who did a great job. We all loved our make up, and she made sure we were all pleased! If I'm ever in need of her services again, I know I'll be in good hands, and I'd recommend her to anyone. Thank you for being so great on my wedding day Lynne! Lynne was absolutely amazing! I showed her a picture of what I wanted for the big day and she took it to the next level and made it even better. She truly has a gift and it's one you should take advantage of for your big day!! I have always been one to struggle with how I feel about my beauty and body image. Since I was a young child going to visit Lynne for eyebrow pluckings, makeup before proms and other important occasions in my life, she was always there for me more than just as a skillful artist who makes all people feel their most beautiful - her warm and nurturing manner, encouragement and grace are what brings you out the most lovely glow in her clients. 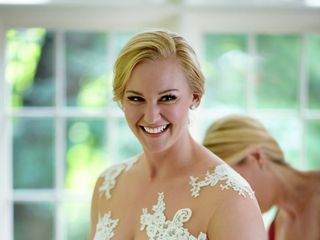 I had Lynne do my makeup for my wedding day and it was beyond perfect - not only did she help me find my beauty within and make me stunning for photos and the ceremony, she put everyone else in the room at ease. She did makeup for my mother, who never wears it, making her feel extremely comfortable. She also did my gender-non confirming Friend of Honor in a way that put them at ease with their inner glow, too. For not only the gorgeous work but for her care and temperament and eye for detail and attention, Lynne Avallone will always be the best makeup artist in New England and beyond. Do not hesitate to book her. She is an absolute professional and wonderfully talented. You won't regret it. Thank you, forever, Lynne, for that magical day! Lynne is a pro!! She is fun and easy to work with. I met her years ago when she did my makeup for headshots. She beautifully covered up a scar on my lip that was still healing from an injury the year before. Her style was light and natural, and I knew that if I had another big event and needed to get makeup done, I would reach out to her. Low and behold I tied the knot on 10/24/15, and got the opportunity to work with her again. She did a lovely job with makeup for me and my bridesmaids. We each had a unique and flattering look. I highly recommend hiring Lynne for any occasion when you want to look gorgeous!!! I got to meet Lynne this past weekend as I was matron of honor in my best friends wedding and I can share with you that she is the best makeup artist that I have gotten and I've been in countless weddings. She did the makeup of 7 bridesmaids, one friend and 2 moms and I can tell you, everyone looked absolutely stunning. To see my best friend (the bride) absolutely glowing and happy on her wedding day was magical. Lynne's warm and caring presence set the tone for the day and made each one of us feel amazing in every way. 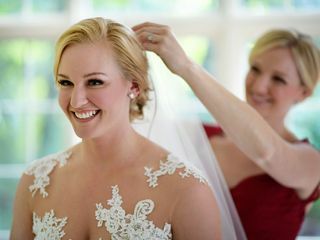 I will absolutely recommend Lynne to any bride or person that wants their makeup done, her talents are hard to put into words, but I tell you, you will feel the beauty that she transmits through the brush. I felt my best version of myself on the inside and the outside, and I believe it's because of Lynne. I had gotten Lynne’s contact info off of the Style Me Pretty website. I had called and made an appointment for a trial. She was very responsive and accommodating to my schedule. I met with her and Kristine Collins at her home for my hair and makeup trial. I had met with 3 other makeup/hair artists prior to meeting them and I hadn’t found anyone that could accomplish the look I wanted, nor had I found anyone that I really felt like I connected with which was also just an important as the look was for me. I knew I wanted people that I enjoyed to be around me the morning of my wedding. I knew from the second I had met Lynne and Kristine that they were the ones I needed to do my hair and makeup the day of the wedding. My trial went amazing and I left feeling like I had been friends with them for years. I had found exactly what I had been looking for. Getting ready the day of the wedding was so much fun. Lynne and Kristine arrived early, got setup right away and we moved through all 10 of us that had to get ready in a very easy and systematic way. They did such an amazing job and they made me feel the most beautiful I have ever felt in my life. They made me look like me, only a better me, and my Groom loved my look just as much as I did. I was so happy with my hair and makeup and with how all of my bridesmaids and the Moms turned out. I can’t say enough about Lynne and Kristine, they were so great! They arrived early, stayed late for touch ups, they did amazing work and all of my bridal party loved them. They were extremely pleasant and relaxing to be around the morning of the wedding. Even though we had a minor scheduling issue come up, I fee like they truly cared about me and making me happy and were going to do whatever they had to do to make sure of that. They never made me feel like just another client. I felt like they were my friends that only wanted the best for me and my wedding. Lynne and Kristine were two of my favorite vendors. Lynne has a gift for making women look amazing! She was on time and keep to the schedule so that everyone was "done" when the photographer arrived. What truly impressed me was her ability to read each woman and bring their individual personalities out with the make-up. Be it either demure, or dramatic everyone looked fabulous! Throughout the night, everything stayed in place and all I needed was a touch up of lipstick. Lynne was so great and easy to work with. She definetly made me look like a super model on my wedding day. She also did my mom's and mother in laws make up and they both looked beautiful. She know how to maximize your best features. Strongly reccomend! I drove all the way to her home for my trial, an hour away. Prior to driving she sent me an email with her exact prices, that is why I agreed to drive to her home for the trial. When I got to her home her and her friend were drinking drinks. She was supposed to do my hair and makeup and forgot about my hair, I had to remind her. My makeup looked awful she told me I would "get used to it". When she was finished she changed her fees from the emailed agreement and made me feel like an idiot. She is unprofessional and a time waster. She should of given me a complete refund.